Get in the bridal spirit with this prequel novella to the fabulous new Mills & Boon Modern Tempted contemporary romance series, The Wedding Season! Bridal shop owner Amber Davis dreaded the moment she'd run in to Parker Robinson while working on his sister's wedding. She'd spent every summer in the Hamptons with his family as a kid, fantasizing about kissing him. But she's shocked to discover that the confident boy who'd given Amber her first taste of love has become a man who mocks its very existence. Parker can't believe the girl who used to follow him around has grown into a beautiful woman—one with some very naughty ideas when she fits him for his tux. But Amber also knows why he's shut everyone out of his life. She's not the kind of woman Parker gets involved with…even if he can't keep his hands off her. Amber doesn't do one-night stands or casual hookups, but she's wanted Parker long enough to make him an exception—especially if she can convince him he needs love in his life, too. 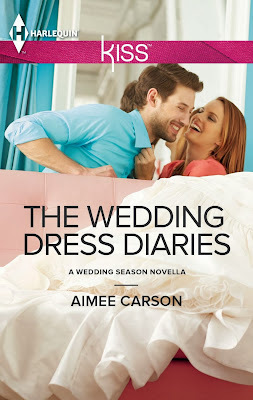 Look for all four books in the Wedding Season series from Mills & Boon Modern Tempted: The Unexpected Wedding Guest by Aimee Carson, Girl Least Likely to Marry by Amy Andrews,Maid of Dishonor by Heidi Rice and Last Groom Standing by Kimberly Lang. I had already read the first book in the multi-author Wedding Season series from Mills & Boon's Modern Tempted range so I'd met Amber and Parker before and was curious to read this story to see how they got together. 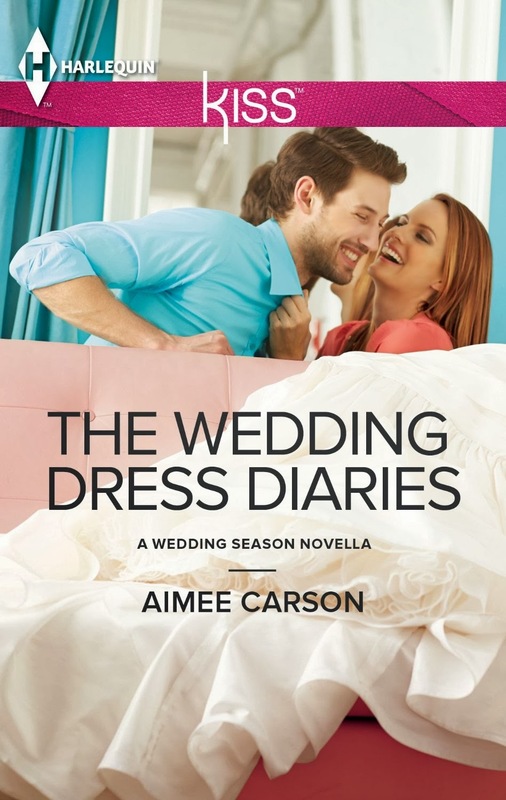 The Wedding Dress Diaries is a quick read but it was a cute story and it makes for a nice introduction to the series. Parker is the older brother of one of Amber's best friends and she has had a crush on him since she was a young girl. He is five years older though and always thought of her as his little sister's pesky friend. Amber is the kind of girl who dreams of big weddings and happily ever afters while Parker has abandonment issues and is determined to never let any woman get close to him. He is happy to stick with one night stands rather than risk getting his heart broken. They haven't seen each other for years until they bump into each other at his sister's engagement party and Parker doesn't even recognise Amber at first but he does find himself attracted to the beautiful woman she has become. Amber is determined to help Parker and his sister build a closer relationship and she is willing to take drastic measures to get what she wants. I thought they make a really cute couple but since this is such a short story their relationship develops very quickly. I would have loved a longer story about them and there was definitely room to do that when you take into account Parker's history. If you're looking for a quick read then it's well worth giving this one a try - especially since it's a free read so you can't really lose. I'm planning on continuing with the rest of the series very soon and hope we'll see Amber and Parker make more of an appearance in future instalments.